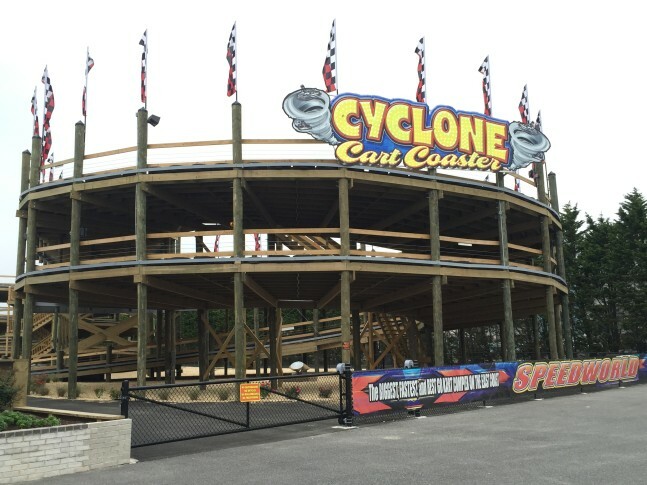 Combine a go-kart track with a roller coaster and you'd wind up something like the Cyclone. OCEAN CITY, Md. – Combine a go-kart track with a roller coaster and you’d wind up something like the Cyclone. The latest attraction at Jolly Roger Speedway puts a twist on the typical circuit, sending drivers five stories high. It has the appearance of a roller coaster but the revving of a race. “We are billing it as the world’s first cart coaster,” says Dean Langrall, director of sales and marketing. The carts, with one and two-seat options, have twice the horsepower as others at the facility to ascend the track. “You kind of have to be on the cutting edge and be unique and reinvent yourself every year in the amusement business,” Langrall says. “If you don’t do some new stuff, if you get stale, people are going to go someplace else,” he says.